The “f/8” part spoke to the fact that Weegee, who seldom shot at any other aperture, was more interested in bringing back a usable picture than in creating great art. In the days before autofocus, shots taken on the fly at medium distance would almost always be reasonably sharp at that depth of field, no matter how sloppy the shooter’s finer focusing technique. Besides, since he was capturing sensation, not romance, why bother with subtle nuance? Weegee’s pictures were harsh, brutal, and grimy, just like the nether worlds they depicted. They were known for their high contrast and for the atomic blast of hard flashgun light he blew into the faces of society mavens and thugs alike. We’re talking blunt force trauma. 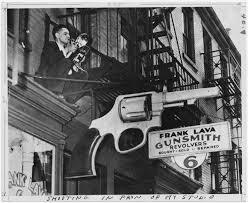 Familiar with action on both ends of guns, Arthur “Weegee” Fellig was the ultimate chronicler of America’s dark side. The second half of Weegee’s golden rule was far more telling for any photographer purporting to be an effective narrator. When Fellig spoke of “being there” he was not only referring to arriving on a crime scene ahead of any competition (which he guaranteed by grabbing early bulletins from the police-band radio in his car and having a mobile darkroom in his trunk), but in being mentally present enough to know when and what to shoot, with very little advance prep. The bulkiness of the old Graphlex and Speed Graphic press cameras (the size of small typewriters) meant that shooting twenty frames in as many seconds, as is now a given with reporters, was technically impossible. Time was precious, deadlines loomed, and knowing when the narrative peak of a story was approaching was an invaluable instinct, one which distinguished Weegee from his contemporaries. Opportunities were measured in seconds, and photogs learned to nail a shot with very little notice that history was about to be on the wing. There will always be arguments about the finer points of focus and exposure, with most debates centering on the first half of Weegee’s prime directive. However, for my money, the urgency of being ably to identify immediacy and grab it in a box far outweighs the niceties of art. Many a Pulitzer Prize-winning image is under-exposed or blurs, while many a technically perfect picture actually manages to drain a scene of any human emotion. Make it f/8, f/4, hell, take the damned thing with a pinhole if need be. But be there. This entry was posted on May 3, 2017 by Michael Perkins. It was filed under Americana, cameras, Exposure, f/stop and was tagged with Arthur Fellig, photojournalism, Street Photography, Weegee.